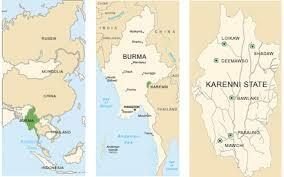 Karenni (Kayah) State is the smallest state in Myanmar. It borders the Mae Hong Son province in Thailand and shares state boundaries with Shan State and Karen States in eastern Myanmar. Karenni State is divided into seven townships, and the state capital is Loikaw. There are approximately 286,000 people living in Karenni State (2014). Karenni State suffers from poverty and a lack of development. Given the conflict in the last half centry, the state has a poor infrastructure, lack of adequate health care and malnutrition. There is also a lack of education opportunities, illiteracy is widespread and the number of schools, teachers and students is the lowest in Myanmar. There has also been serious deforestation and environmental degradation in Karenni State as a result of some development projects. Although there is a wealth of natural resources in Karenni State, including teak, tin and tungsten, the local population report next to no benefits from the extraction that takes place. Instead, many of these projects hamper the Karenni people’s traditional agricultural and farming activities. The dams on the Salween River are a core issue for Karenni people. These dams are being planned by Burmese, Chinese and Thai companies. The communities living along the Salween River look set to suffer the detriment of these dams but it is likely they will receive little of the benefit. Karenni State already plays host to two dams: Lawpita and Mobye. These dams are well-known for a lack of benefit to local people. This link provides a detailed explanation of dam issues. The damage that the dams have caused includes both environmental and human rights abuses. The latest project is the Ywathit Dam. The Ywathit Dam is planned to be built in an area along the Salween River where most of the community have fled conflict in the past. There has already been surveying work and timber concessions in the surrounding area. For more information about the Ywathit dam click here. Another key issue in Karenni State is mining at Mawchi mine, Bawlakhe division. This mine was originally opened by the British. There are regular landslides at the mine which affect the surrounding villages. The mine is jointly controlled by the No. 2 Mining Ministry and the military-owned Union of Myanmar Economic Holdings Limited and operated by the Kayah State Mining Company Ltd, headed by ex-military officer U Ye Tun Tin, USDP MP for Pasaung Township. More recently, the Burmese government has been granting mining concessions for this area. A massive expansion is being proposed with the Mawsaki Company, an unknown Australian company and the Burmese Actor, Lwin Moe. Later in partnership with the Karenni Civil Society Network, the Molo Women’s Mining Watch released this statement. They also published this pamphlet. Land confiscation is an important issue in Karenni State and Myanmar. Many villagers have had their land confiscated by the Burmese military and are fighting to get it back. The NLD government recently established a Central Review Committee for the Confiscated Farmlands and Other Lands with the aim of addressing this issue. We recently published a report on land confiscation, based on independent research that we conducted in Karenni State.